J & I used to always say, "someday, we will live off the grid." Not because we wanted to prep for doomsday or a zombie apocalypse, but simply because we thought it sounded cool. We got our wish. The place we are living this summer is off the grid. We don't get mail here, have no phone service (not even a landline, much to my chagrin), use propane lights and gas stove, all that good stuff. And while we can admit it is pretty "cool," there's a huge learning curve that goes with it and it is harder than we would have thought. If you want a little lesson in off-grid living and electricity usage from someone with only 7 weeks of experience, read on. The house/lodge uses a combination of solar, wind and generator. All of these things store power in batteries. The average US household spends 54% of their utility bill on electricity and uses up to 30 KWH (kilowatts of power for 1 hour) per day. We've already told you how we had to give up energy suckers like coffee makers and toasters. And of course no TV. You can consume 1 KWH in 5 hours with a TV! But, this house is large and is a business, so some of what we are learning wouldn't apply to smaller households, or a tiny house, for that matter. Conserving electricity when we have guests is tricky; figuring out how much electricity they may use (there are real lights in their bedrooms) and how long we have to run the generator without disturbing them too much. J & I hardly use lights and only plug in our electronics when the generator is on, but there are things that just draw the electricity constantly. Let's just say, we learn as we go. As soon as we think we have it figured out, we realize we don't. We also pick what we can from the wild and are getting better at foraging for our food (pictured below: chanterelle mushrooms). The one area we haven't ventured into is fishing and hunting. We had a family staying here in one of our cabins a few weeks ago and they caught so many fish (perch) everyday from the lake. So many that I think that's all they ate. 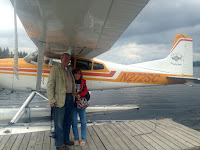 Visitors to the village always have the option to come via float plane! And that's my take on off-grid living so far. Just like backpacking, it makes you appreciate the little things even more. I don't mind line-drying our laundry, but I also love the luxury of a dryer.